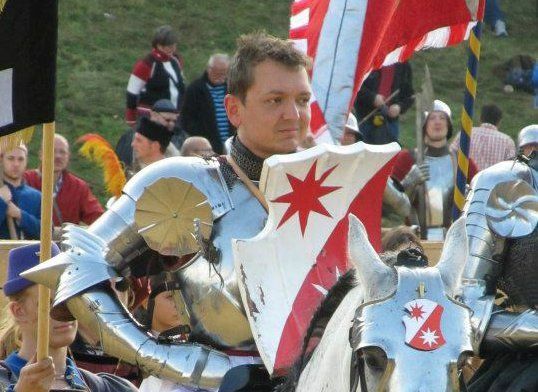 As mentioned in the article announcing the various winners of “The Grand Tournament in Sankt Wendel”, Andreas Wenzel won the “Joust of the Squires” – the competition between those who jousted in standard battle armour rather than in armour specifically crafted for jousting tournaments. Please describe the person, place or thing that made the biggest impression on you when you first arrived at/during the days leading up to “The Grand Tournament in Sankt Wendel”. I think it’s important to point out that St. Wendel was not just a meeting of internationally respected jousters, but also of some of Europe’s best jousting support crews. UK characters like Adam des Forges (the event’s head valet, an artisan/commentator/interpreter of Royal Armouries pedigree and general God of Knightly Support) and Mark Griffin (the event’s time keeper, arguably the top UK historic event organizer, and certainly the funniest) working together with the wider Dutch and Norwegian jousting teams, and then meeting the horse lords from Bueckeburg and the leading lights of German 15th century re-enactment was… well, awe-inspiring. Not discounting all the guys from other countries, including the US, Ukraine, etcetera, the historians behind the event and the city’s event team….. Seeing all these people from around Europe and further afield, many of which have heard of each other before but never met, being forged into one amazing team by their personal huge passion for this event was a tremendous privilege and certainly my personal highlight. The universe must have bent from all the awesomeness concentrated in one place that weekend! Please describe one or two of your favorite non competition related moments during the time you were in Sankt Wendel. Andreas: No. 1: The Thursday training day. 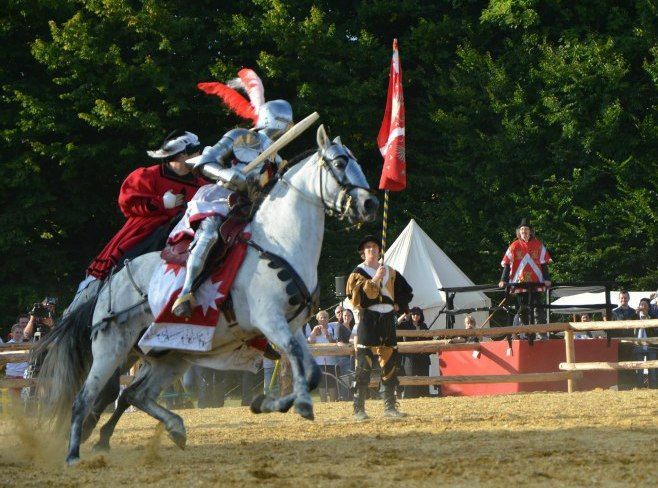 Jousting against Joram, hitting an attaint on his visor and scratching it, receiving my hardest hit of the weekend in return, being saved by my war saddle, and bruising my bottom on the rear cantle while doing so – how cool is that? Riding Sigismund well into the pass and being praised for my riding by Christin Krischke (the Director of the Court Riding School – there is no higher praise possible in my book). And then being declared winner of the training melee – I was a very happy chap that day. Andreas is the jouster in red and white. His interview begins at apx 1:48. You can read an English transcript of this video here. 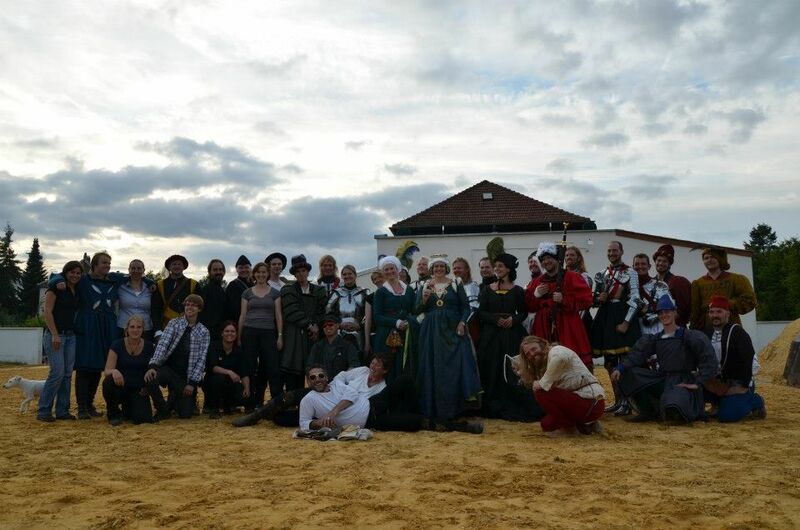 Please describe one or two of your favorite moments during the competition of “The Grand tournament of Sankt Wendel”. 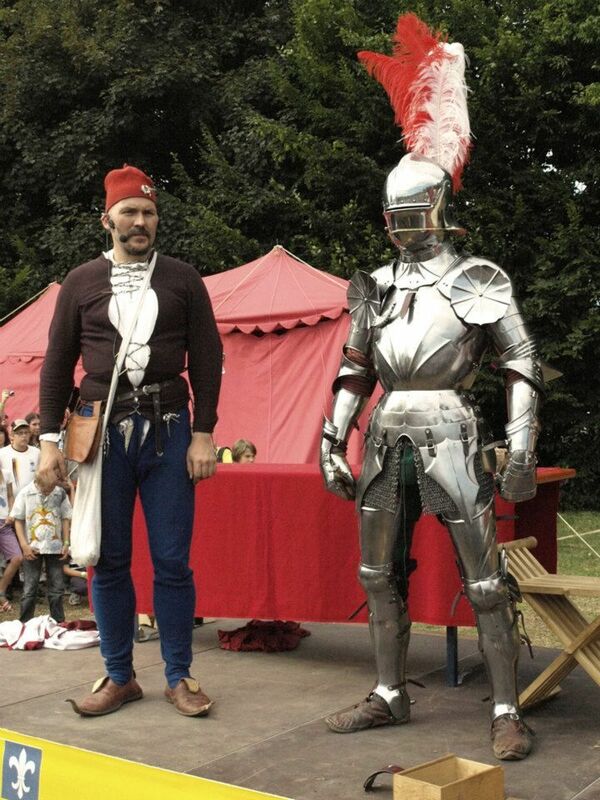 Andreas: I think my favourite (proudest) moment here must be winning the melee on Saturday, and thus becoming victor of the day despite a poor jousting session earlier – even though I had to accept the honour on foot due to my broken war saddle. I also really enjoyed the entry and exit parades. Riding into that arena in a line with some of the greatest competitors in our sport made me very proud. And I could feel Sigismund picking up on this every time, growing under my seat and putting himself in the most excellent outline – really cool. Arne Koets was chosen by the Ladies Jury as the “Winner of the Prize for Highest Bravery”. Why do you think he was chosen? Andreas: Well, it was given as a prize for highest bravery and chivalry. The thing with chivalry prizes is often that those who decide who get them know little about what chivalry actually means in the medieval sense. Often you get those for being nicest to the Ladies and grooms, reflecting the Victorian idea of chivalry. I don’t believe this was the case at St. Wendel. I noticed the Lady judges observing and rewarding the conduct of each competitor in the lists, and Arne certainly stood out here. He was constantly pointing out noteworthy deeds of other competitors to the Tournament Master and the Ladies, and on more than one occasion rejected points awarded to him because he didn’t feel he deserved them (for example when he felt he was too far from the tilt for his opponent to hit him safely). I felt he stood out on true chivalric virtues like Generosity (bestowing his final points to the competitor he injured, thus forfeiting tournament victory, and pointing out honourable deeds of others), Honour (always fighting hard and looking fantastic while declining points when not agreeing with the judgment), High-Mindedness (always positive even in the face of adversity), Steadfastness (taking on every man in the Imperial team) and Loyalty (retiring his horse when tired during the final melee). In my personal view Arne absolutely deserved the Chivalry Prize, and I wholeheartedly congratulate him. Congratulations on winning the “Joust of the Squires”. What would you like to say about that? Andreas: Well, I am of course immensely honoured, and the rather awesome dagger has a special place in my living room right now. As I was competing in a field harness (joust of war), I was in a separate competition from most of the jousters (the “knights” using frogmouths or grand bascinets), so the squires’ dagger was the highest trophy I could have hoped for, and I am very pleased with the outcome. 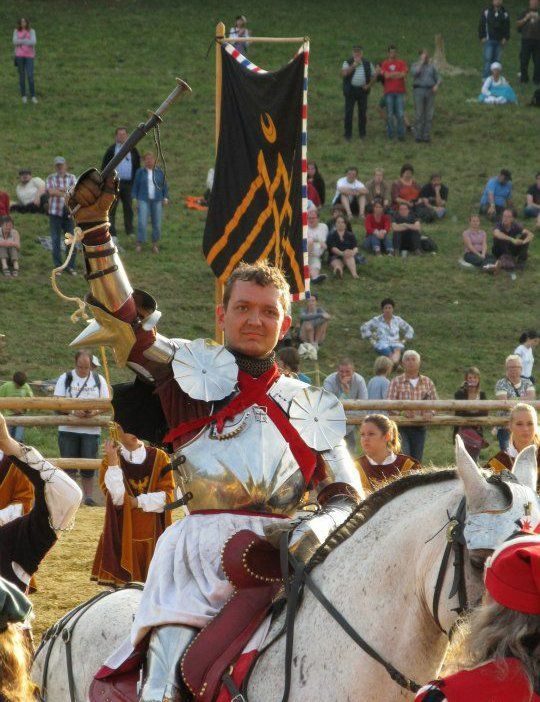 Andreas Wenzel holds the prize for the Joust of the Squires. It’s interesting that I scored so highly despite not doing well at all in the joust. I won my points by being in the winning team during the Melee on all three days, and by being declared Melee victor on Saturday. This is a powerful illustration of how biased the scoring was towards the Melee, where horsemanship prevails, as opposed to the joust, which is by far the more dangerous discipline. This was a big surprise to me, to be honest, as I am sure it was to everybody else… You can really see the scores reflecting the tournament’s focus on horsemanship. Even though he was injured and unable to complete the competition, Joram van Essen still won the overall tournament, in part due to other competitors contributing to his score. Arne Koets gave Joram enough of his own points to put Joram in first place ahead of Arne. Please explain how and why that happened and what part you played in this point exchange. Andreas: Well, I had nothing to do with this exchange whatsoever other than witnessing it. The thing is – this tournament was not scored like a modern competition, but like a medieval one. Which means it wasn’t about breaking the most lances or hitting the most people with your club. It was about impressing those who judge (here the Ladies) with your prowess, about looking good, about being noted. It was about doing awesome deeds. This is a big difference which we all struggled with somewhat, but which made for a completely different competition in the end. It was enlightening and very cool. Most importantly, it resulted in the right man winning. Joram is the one who has prepared most diligently for the tournament, who has worked hardest on his horsemanship and his lance technique. He was the best jouster in the lists and the fiercest warrior in the melee. When he accepted the honour of daily victor on Friday, his Murgese (!) stallion strode forward in the most aggressive of Spanish walks, striking awe into every man, woman and child witnessing it (flash git). He is the medieval tournament champion come flesh, and the closest image of the medieval knight I have yet seen. My sincere congratulations go to him for the achievement of a lifetime’s worth of dedication. What would you like to say about/to the squires, ground crew and/or others who helped you during your participation in the GTSW. Andreas: Well, I said a lot about the wider team already, so here I’d like to mention my valet, Andrej Pfeiffer-Perkuhn of Geschichtsfenster. Never before have I been looked after so well during a tournament. Andrej was always there when I needed him, supplied his personal property to improve the visual impact of the display, pulled in all sorts of craftsmen from the German re-enactment community to fix kit issues and improve the shows, delivered a cracking arming show together with German armourer Peter Mueller, and is a real specialist in armour maintenance – never was my sallet closed helm so shiny. I was particularly impressed with how he dealt with the challenges of the arena shows, him never having been near horses or in an arena. My lance was always close, no matter how excited Sigismund got, which I think is owed to Andrej’s guts and trust in my horse and me. I owe him my sincere gratitude for his hard work and dedication to the job. I also have to mention Jan and Nadja of the Court Riding School Bueckeburg for looking after Sigismund so well and providing supreme service at the stables – a team of true professionals all in all. What would you like to say about/to Arne Koets and the other organizers of the GTSW? Andreas: Who? Arne Koets? Is that that jousting bloke who wanted to become a better rider, and ended up finding the Court Riding School in Bueckeburg? Who gave up his job to move and work there in exchange for riding lessons? 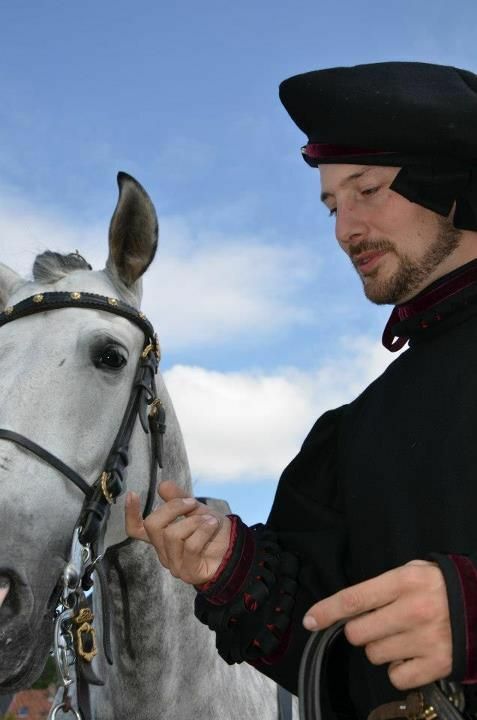 Who ended up becoming one of the most respected horsemen in medieval re-enactment? Who then took on this project in St. Wendel, and kept convincing everybody that it was the right thing to do? Who got the Hofreitschule involved with it? Who beckoned, and most of the World's greatest historical jousters followed? 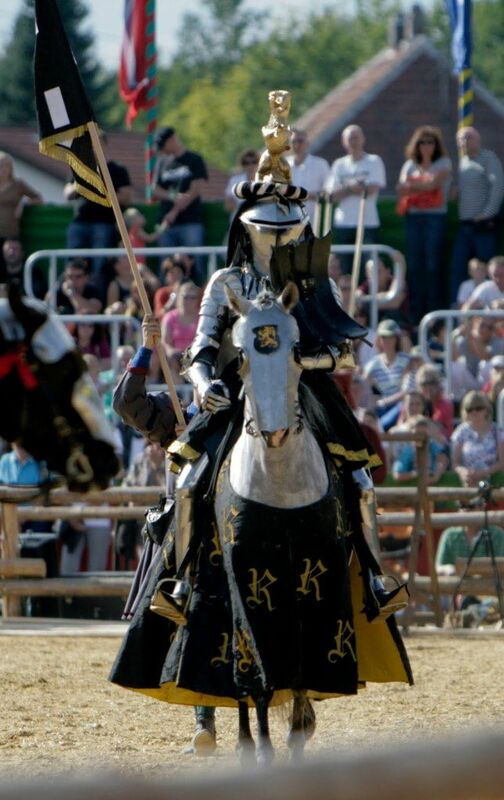 Who transformed the European jousting community’s approach to horsemanship? Who pushed the boundary of everything and everybody involved out by about a mile? 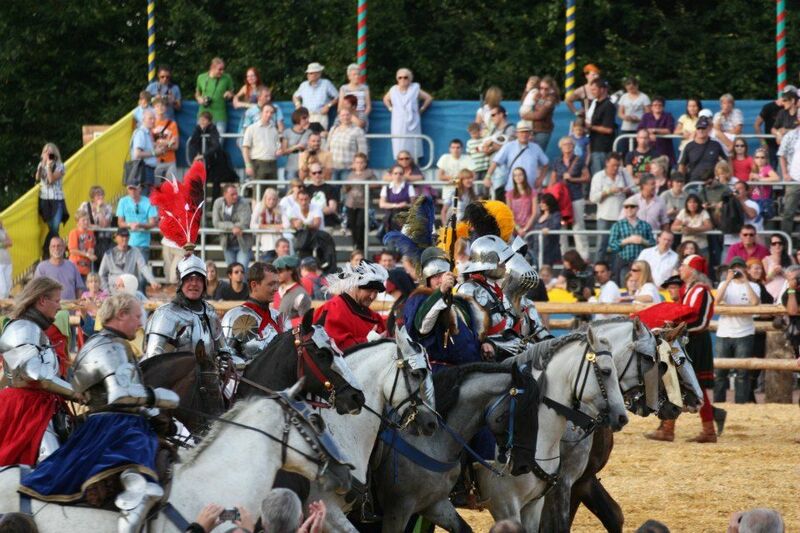 Who created the first real medieval tournament since 1565? 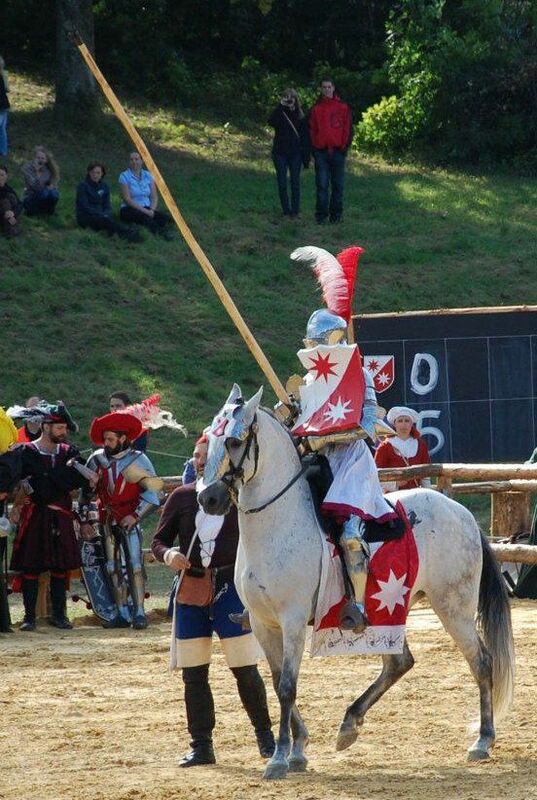 Who probably transformed historical jousting forever? Who arguably changed German public opinion of historical re-enactment while doing so? Uhm, no, can’t think of anything. Well, he’s pretty influential in jousting right now. I think I also have to mention Dr. Alfred Geibig (Curator Arms & Armour, Veste Coburg), Dr. Josef Dreesen (Historic consultant to City Museum St. Wendel) and Thomas Wuest (Head of PR, St. Wendel) – together with Arne Koets, the core team that made this amazing event possible. What would you like to say about your overall experience at the GTSW? Andreas: The experience of a life-time. A game-changer. 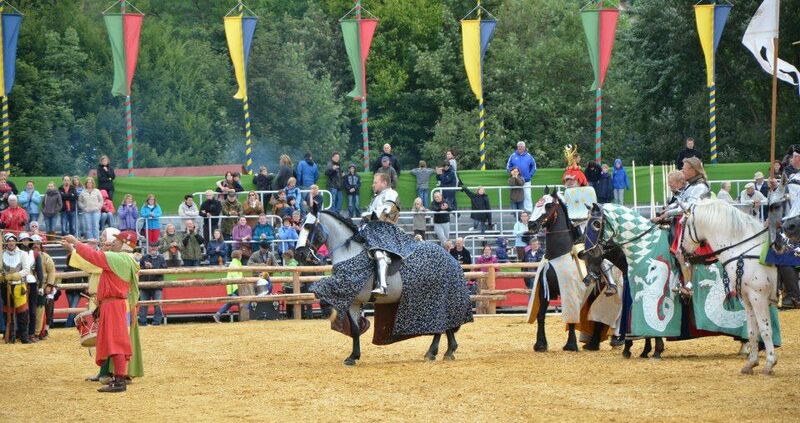 Jousting will never be as it was. Well, actually, it will now be as it was. What a great interview - it was a brilliant weekend. I really hope someone organises something similar in the UK ! Thanks! I also hope for more of these tournaments.